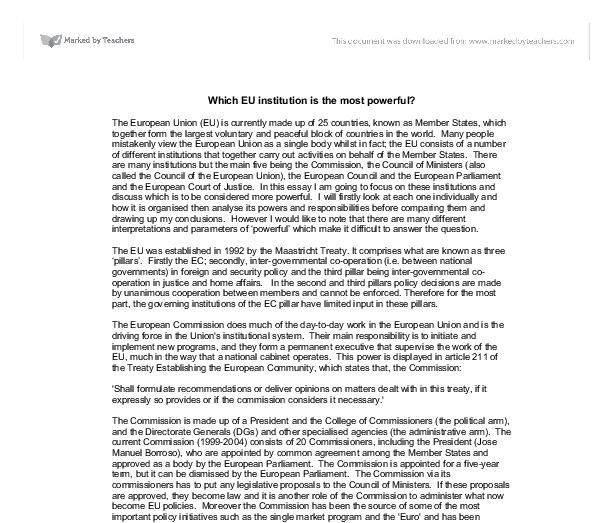 Which EU institution is the most powerful? The European Union (EU) is currently made up of 25 countries, known as Member States, which together form the largest voluntary and peaceful block of countries in the world. Many people mistakenly view the European Union as a single body whilst in fact; the EU consists of a number of different institutions that together carry out activities on behalf of the Member States. There are many institutions but the main five being the Commission, the Council of Ministers (also called the Council of the European Union), the European Council and the European Parliament and the European Court of Justice. In this essay I am going to focus on these institutions and discuss which is to be considered more powerful. I will firstly look at each one individually and how it is organised then analyse its powers and responsibilities before comparing them and drawing up my conclusions. However I would like to note that there are many different interpretations and parameters of 'powerful' which make it difficult to answer the question. The EU was established in 1992 by the Maastricht Treaty. It comprises what are known as three 'pillars'. Firstly the EC; secondly, inter-governmental co-operation (i.e. between national governments) in foreign and security policy and the third pillar being inter-governmental co-operation in justice and home affairs. In the second and third pillars policy decisions are made by unanimous cooperation between members and cannot be enforced. Therefore for the most part, the governing institutions of the EC pillar have limited input in these pillars. ...read more. assisted by their Foreign Ministers and the President of the Commission meet as the European Council known as Summits to the media. The European Council meets at least twice a year in Brussels under the Presidency, which is held by a member state and changes every six months. They meet primarily to define general policy guidelines. While not established by the Treaties of Rome, it was informally introduced at the Paris Summit 1974. The European Council was formally recognised as an official body of the EU in the TEU. There are three main tasks for the European Council. 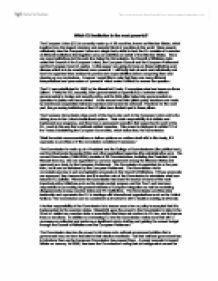 Firstly to provide a forum for discussing topics and policies that fall outside of the Treaty, usually relating to the future development of the Union. Secondly to facilitate the legislative process, by removing barriers in the Council of Ministers. The HOSG have the authority to resolve problematic issues that have been blocked by a lack of consensus; they are also able to construct package deals covering several policy areas. They also create policy and guidelines for the Common Foreign and Security Policy (CFSP). Over the years the European Council has risen to the top of the EU's decision making hierarchy and is now a major agenda setter. Direct elections to the Parliament, monetary union, and the initiative of an EU rapid reaction force have all been launched at European Council level. Major Treaty reform also is agreed at this level.2 The European Parliament is the only democratically elected body of the EU. ...read more. The EU institutions can be taken to Court as can member states if they are not fulfilling EU law and the Court's decisions are final, giving the Court great power and responsibility over all the institutions. However, member states have limited the Court's power in the second and third pillars. The European Council, the most recent of institutions, categorises with the Council of Ministers to make 'The Council'. However, separately it could be more powerful than the Council of Ministers because it is here where major decisions and policies are made. It guides the EU for the future and resolves problems amongst the other institutions. However I would still argue that the Council of Ministers is more powerful as the European Council meet only maybe twice a year while the decision making Council of Ministers are influencing the EU all year round with the majority of legislative. It is clear how the member states are not willing to pass legislative powers to a supranational body such as the Commission or other EU institutions but instead pass the legislative powers to the Council which consists of national government ministers, this is characteristic of a confederal system with federalising tendencies. Moreover the EU has moved away from the limits of a neo-functionalism system and more towards liberal intergovernmentalism. This has again removed some of the powers of the Commission and given greater significance to the role of the Council of Ministers as a legislative body representing the interests of the member states. Indeed, there is no question that the member states have lost powers to the EU and have less political and economic independence than they did at the outset of the EU. ...read more. Therefore, as all commissioners must favour all countries evenly, the fact that the larger countries, such as the UK, seems to be a somewhat pointless exercise, and implies that they are their on behalf of their countries, even though they are there on behalf of the EU. not only losing their old currency, national pride etc, but also strong economically and stable countries would have to make decisions for other weaker countries. Also the cost of producing has proved to have been a very high one. The cost of contributing in the EU is high too. will target sensitive issues, enhancing board members' responsibility by setting out procedures for directors' disqualification, wrongful trading, and a special investigation right for investors. Despite being created with good intentions, with its mix of policy instruments, it may be more difficult than envisaged, to implement the Action Plan. The Paris park returned to profitability and attendance augmented. However, the brief holiday on royalties, management fees and leases has now come to end and profits are dripping again. Disney's reaction was to expand with a second "Disney Studios" theme park and an adjoining retail and office complex at the Paris location. in 1833 the factory act had been in introduced to improve the working conditions in industrialised factories. The Whigs having come into power at a time of national discomfort wanted nothing more than to have peace. Therefore they wanted to end the corruption of the old Law and increase efficiency. After sixteen months of deliberation and compromise the draft constitution completed and handed over to the European council in Thessalonika for ratification and adoption by the IGC in 2004. However, there are still debates and disagreement amongst MS on certain issues in the constitution of which they consider as redlines and are not ready to accept such terms.